Jaguar's StuG IIIG interior provides all the parts necessary to build a very detailed driver's position and fighting compartment for Tamiya's superb new StuG IIIG. 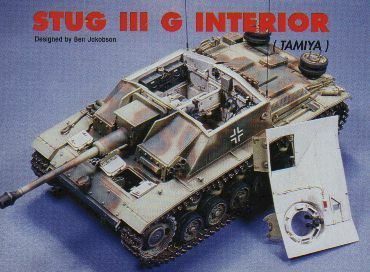 The StuG IIIG interior is an improvement over Jaguar's earlier StuG IIIF offering (see my Modelling a Sturmgeschütz III Ausf. F of the Grossdeutschland Pz.Gr.Div.). Its engineering is simpler (only 50 parts compared to over 100 in the StuG IIIF set) whilst actually refining and adding to detail. As always, Jaguar's moulding quality is first rate. The light pink coloured resin has no bubbles and detail is extremely sharp. There are casting blocks and a fair amount of structural "flash", but these should present no problem to the moderately experienced modeller. Straight casting blocks can be removed by a simple "score and snap" method; and more complex parts can be removed by "nibbling" away at the casting block with a fine set of pliers or a small hobby knife. This set features some wafer thin parts that eliminate the need to thin kit sidewalls and other surfaces. It also greatly simplifies the assembly and positioning of the transmission, brake and final drive housings by incorporating them onto the driver's floor and forward sidewalls. In fact, many features have been cleverly and convincingly combined to minimise the total number of parts while not compromising on detail. For example, the rear superstructure wall, noticeably bare in the StuG IIIF set, has a mass of detail including fume extractor, fusebox, stowage points for machine pistols, and even a stowage door moulded open to display the ends of rack-mounted 75mm shells. All this is moulded as a single piece. Further bonus parts include very nice optics for the 75mm gun (breech and mount provided), a nicely detailed driver's direct vision port and 3 stowed machine guns/pistols. There are even two spent shell cases moulded into the bottom of the gun breech basket. The only downside to this delicate moulding is that some parts will inevitably be warped in transit. Some of mine certainly were. However, bathing the offending parts in warm (not hot!) water will soften the resin enough to straighten it out. The only obvious omissions are the transmission hatches, rear-of-mantlet detail (although Tamiya's mantlet is pretty good) and full 75mm rounds for the ready racks (although the Tamiya brass rounds are much nicer than Jaguar's resin version included in the earlier set). The instructions are as cursory as ever, although this is not such a problem with the simpler parts breakdown. They consist of one double sided, photocopied sheet with a parts list and 15 indifferent quality photos without captions. Comparison with the StuG IIIG interior photos in Achtung Panzer No. 5 - Sturmgeschutz III, StuG. IV and SIG. 33 indicates that Jaguar have really done their homework. Apart from omitting some bolt-head detail on the sidewalls, the wire cage for the fume extractor, a couple of racks and electrical/radio wiring, Jaguar have produced a very complete and accurate interior detail set. I have not actually built this interior yet, but it looks like there is less potential for fit problems due to the simplified parts breakdown. As always with this type of conversion, test fit parts thoroughly before assembly! This is a well thought-out and executed item that will appeal to a wide range of modellers. If you are looking for a project to move to the "next stage" of armour modelling, this may just be it. If you are an old hand looking for a super-detailing project, combined with the Verlinden engine bay this might just be the ultimate Sturmgeschütz! Gunze have released a different version of this set to improve and detail the Dragon/DML/Gunze late StuG IIIG, which I shall review separately. Review Copyright © 1998 by Brett Green, January 1998.